It sounds as if Radon will be an ongoing character in what appears to be a twisted fairy tale series. How many books do you have floating in your noggin for the series? Or, is that a moving (expanding) number each time you think or read or take a nap? Well I’m definitely going to write the next one. Then we’ll see. If they do well, maybe I’ll just keep writing them. The “plan” (something subject to change without notice or at whim) is to write maybe one long novel per year and a few novellas. Now that means I need to speed up the writing and quit the day job. Both in the “plan”, I guess we’ll just have to see how it rolls out! Is your book similar in “feel” to something else out there? For instance, if I like Laurel Hamilton’s or Charlaine Harris’s books, will I like yours? Who would you compare your writing to? It’s been so long since I actually read Charlaine Harris that I can’t even remember her writing style. I do watch True Blood and love it! I also am a closet Laurel K. Hamilton fan. Shhh, don’t tell anyone. I have to say this particular novella is quite a bit lighter than her stuff. It has some darker elements, but it is has some more and since it’s a novella the plot had to be quick. Can I say, likely somewhere between those two? And as far as the heat level, I’d say it’s definitely lighter then LKH, especially her Meredith Gentry series (those are scorching!). But it is much stronger than Charlaine Harris’s. I think if you like those authors, you’d like mine. I’d love to find out! Well, okay then! I’m all for something in-between those two. In reality, I’m sure you are an original, but people always want a point of reference. 1. You’ve added elves and witches to The Queen’s Huntsman. How much do you rely on fairy tale lore and how much do you allow your imagination to run wild rebuilding the tried and true story? 2. Have you researched the origins of any of the fairy tales you’ve twisted? 1. I think my imagination runs rampant. My twisted tales are definitely different from the original version. I started reading twisted fairy tales years and years ago and it astounded me the variety and themes that could be wound through the classics. I try to twist the main plot line, change the characters in some way that leaves a common thread tying the original to them, but gives them their own place and time. And then it’s nice if you leave the trademarks. 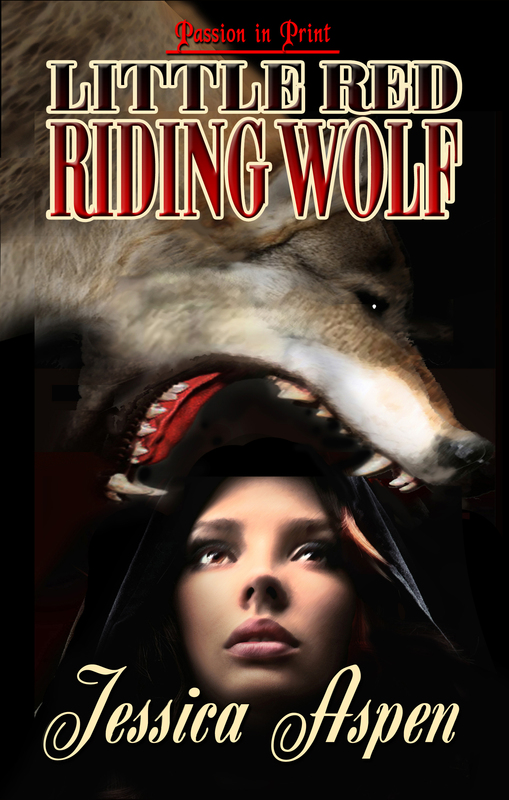 For example, in Little Red Riding Wolf, she wears a red hoodie instead of a hooded cloak. By making her the wolf the story is automatically on an entirely new line and the hard part is keeping some pieces true to the original. 2. I have researched many of the fairy tales. For instance, Little Red Riding Hood as we know it was written by a French man named Charles Perrault and he has a definite cautionary paragraph about how little girls should not trust strangers. When you read it you know he was talking about the vulnerability of girls and sexual predators. Something we think is an entirely modern problem he dealt with in a fairy tale. But that isn’t the oldest version around. The oldest version, we know of, is from China. It is called Lon Po Po and it has three little girls. Their mom leaves them to go see Grandma and they trick the wolf and protect themselves. I love reading the other versions! I love your idea for twisting fairy tales, Jessica. Do you have a favourite fairy tale? Do you plan on having one character play a part in all your tales? Will the stories connect in some way? I don’t know that I have a favorite. When I was younger I always liked the ones based on Donkeyskin, I think there is another titled Bearskin that has the same theme. The princess has to run and hide and cover her beauty up with an ugly disguise, only the Prince discerns that there might be something wonderful underneath. Usually her cleverness brings her through to her happy ever after. There is a great twist on this one by Robin McKinley called Deerskin. Fabulous author and a very clever twister of tales. Maybe someday I’ll do that one. For now I’m sticking with the well known classics and keeping them set in a similar town for the novellas. The Queen’s Huntsman is another matter, and if it ever sees the light of day I’ll talk more about it. For now I’m sticking with shapeshifters, a modern setting, and the classics. As for common characters, not in the next one, maybe the one after that! Thanks for asking.